Étagère, 19th century, walnut, maker unknown, France, 76 cm x 42.4 cm x 31 cm. Log box, circa 1917, painted wood, decorated by Duncan Grant, 31 cm x 34 cm x 34 cm. Bedstead, circa 1930, wood and metal, manufactured by Heal's, 105.5 cm x 91.5 cm 201.3 cm. Armchair, 1901-10, walnut, maker unknown, rayon upholstery, 'Clouds' design by Duncan Grant 1932, reproduced by Laura Ashley 1987, 84 cm x 66 cm x 96 cm. Chest of drawers, 19th century, mahogany, maker unknown, 106.5 cm x 107 cm x 51 cm. Chest of drawers, late 19th century, walnut, brass, maker unknown, 119 cm x 121 cm x 53.5 cm. Chair, wing chair, circa 1900, wood, upholstery, maker unknown, 108.5 x 62 cm x 66 cm. Bedside table, late 19th century, wood, iron, maker unknown, 66 cm x 62 cm x 46 cm. Bedstead, circa 1910, mahogany, cast iron, maker unknown, 95 cm x 111 cm x 201 cm. Prov: Introduced to Charleston during the 1980s restoration. Bedstead, circa 1920, oak, iron, Heal's original, restored or replicated, 1985, 102 cm x 107.6 cm x 207.2 cm. Dressing table, mid 19th century, walnut, glass, velvet, maker unknown, England, 160 cm x 141 cm x 55 cm. Prov: Bequeathed Leslie Stephen to V. Bell. Formerly in the Stephen family home at Hyde Park Gate. Chest of drawers, circa 1650-99, oak with brass fittings, maker unknown, 95 cm x 101.5 cm x 5 cm. Chair, circa 1913, set of six, lacquered pine, designed by Roger Fry, produced by the Dryad Company, Leicester, for the Omega Workshop, 101.5 cm x 49.5 cm x 51 cm. Prov: V. Bell. Piano, circa 1775, mahogany with ebony and boxwood inlay, made by Jacob and Abraham Kirkman, London, 79.5 cm x 154 cm x 49.5 cm. Prov: Bartle family estate to Duncan Grant. Display cabinet, 19th century, ebonised on gilt mounts, glazed, maker unknown, 175 cm x 70 cm x 51 cm. Prov. Bequeathed Leslie Stephen to V. Bell. Formerly in the Stephen family home at Hyde Park Gate. Buffet, late 18th century, cherry wood, maker unknown, France, 94 cm x 130 cm x 59 cm. Prov: Purchased in Provence by V. Bell/D. Grant. Table, 20th century, painted wood, decorated by Angelica Garnett, 42 cm x 30 cm x 24.5 cm. Console table, late 18th century, painted wood, maker unknown, Venice, 82 cm x 120 cm x 67 cm. Chair, circa 1810, French Empire fauteuil, upholstered fruitwood, maker unknown, France, 85.6 cm x 61 cm x 24 cm. Prov: Purchased in Provence by V. Bell/D. Grant. Chair, circa 1810, French Empire fauteuil, upholstered fruitwood, maker unknown, France, 85.6 cm x 61 cm x 24 cm. Table, early 20th century, painted wood, decorated by Vanessa Bell, circa 1952, over earlier decoration of 1930s, 70.5 cm x 199 cm x 199cm. Barometer, early 20th century, metal on pine board, maker unknown, 58.7 cm x 21 cm x 6 cm. Tea caddy, late 18th century, mahogany with boxwood stringing, lined with tin, maker unknown, 10.2 cm x 18.6 cm x 11.8 cm. Bellows, circa 1920, oak with iron fittings, maker unknown, 47 cm x 20 cm x 6 cm. Bookcase, 20th century, pine, maker unknown, Charleston, 190.6 cm x 167 cm x 19.3 cm. Table, circa 1930, beech table made by J. Kallenborn, top inset with 36 tiles decorated by Duncan Grant, 46.5 cm x 60.5 cm x 80.5 cm. Bookcase, early 20th century, grey painted pine, maker unknown, 150.5 cm x 125.6 cm x 27 cm. Music case, circa 1910, painted wood, maker unknown, 102 cm x 112.7 cm x 36.6 cm. Bookcase, 20th century, pine, maker unknown, 120.7 cm x 91.5 cm x 25 cm. Bookcase, 20th century, pine, maker unknown, 120.5 cm x 91.5 cm x 25 cm. Bookcase, 20th century, pine, maker unknown, 121.5 cm x 90 cm x 24 cm. Cupboard, late 18th century, cherry wood, maker unknown, France, 148.4 cm x 122 cm x 51.3 cm. Table, 19th century, marquetry, maker unknown, Holland, 72.8 cm x 122 cm x 91.5 cm. Prov: A wedding present to Clive and Vanessa Bell in 1907. Armchair, circa 1920, upholstered, covered in a Laura Ashley facsimile of Vanessa Bell's 'Abstract' textile, maker unknown, 82 cm x 51.5 cm 77 cm. Armchair, mid 17th century, walnut with upholstered back and seat, covered in a Laura Ashley facsimile of Duncan Grant's 'West Wind' textile, maker unknown, French, 105 cm x 66 cm x 73 cm. Mirror, circa 1820, gilded wood, maker unknown, Continental, 57.5 cm x 60 cm x 6 cm. Chair, late 18th century, painted wood with rush seat, maker unknown, 99 cm x 46 cm x 50.2 cm. Prov: Purchased by D. Grant in Rome 1920. Chair, late 18th century, painted wood with rush seat, maker unknown, 99 cm x 46 cm x 50.2 cm. Table, early 19th, lacquered beech and porcelain, maker unknown, China, 75.5 cm x 86.5 cm x 51 cm. Mirror, circa 1750, gilded wood, maker unknown, France, 110.5 cm x 50.5 cm. Table, circa 1750-99, fruitwood, maker unknown, 71 cm x 78.5 cm x 45.5 cm. Prov: Introduced to Charleston by A. O. Bell during 1980s restoration. Mirror, circa 1880, mahogany, maker unknown, 193.2 cm x 63.7 cm. Prov: Introduced to Charleston by A. O. Bell during the 1980s restoration. Table, early 19th century, lacquered wood with painted and gilded decoration, maker unknown, 68 cm x 31.5 cm x 30 cm. Prov: Bequeathed Leslie Stephen to V. Bell. Formerly in the Stephen family home at Hyde Park Gate. Mirror, 19th century, gilded and moulded frame, maker unknown, France, 129.2 cm x 27 cm. Table, 19th century, ebonised wood, maker unknown, 69 cm x 70.5 cm x 53 cm. Prov: Bequeathed Leslie Stephen to V. Bell. Formerly in the Stephen family home at Hyde Park Gate. Armchair, early 19th century, upholstered wing chair, maker unknown, 99.5 cm x 71 cm x 68 cm. Washstand, 19th century, mahogany, maker unknown, England, 76 cm x 32.6 cm x 33 cm. Sofa, Edwardian, maker unknown, loose cover originally by V. Bell, materials copied and dyed by Cressida Bell circa 1985, 85 cm x 138 cm x 93 cm. Card table, 18th century, veneered with marquetry inlay, maker unknown, Holland, 76.2 cm x 106.6 cm x 53 cm. Mirror, 18th century, gilt and gesso frame, maker unknown, France, 48.5 cm x 43.5 cm. Armchair, 19th century, wood with loose cotton cover, maker unknown, 88 cm x 98 cm x 98 cm. Table, 19th century, oak, maker unknown, 73 cm x 106 cm x 52 cm. Prov: Introduced to Charleston by A. O. Bell during 1980s restoration . Table, late 18th century, walnut, maker unknown, France, 67.4 cm x 42 cm x 32 cm. Prov: Purchased in Provence by V. Bell/D. Grant. Armchair, late 19th century, wood with loose cotton cover, maker unknown, 89 cm x 90 cm x 85 cm. Bookcase, circa 1920, grey painted softwood, maker unknown, 93 cm x 110.2 cm x 22 cm. Screen, circa 1934, wood and canvas, painted by Duncan Grant at 8 Fitzroy Street, London, 132.5 cm x 183 cm x 2.1 cm. Table, circa 1950, painted wood frame with ceramic tiled top, decorated by Quentin Bell, 42.7 cm x 50 cm x 55.2 cm. Bellows, 19th century, elm with iron and leather fittings, maker unknown, 58.3 cm x 26 cm x 5.8 cm. Washstand, circa 1880, pine and marble, maker unknown, decorated by Vanessa Bell circa 1917, 83 cm x 61 cm x 43 cm. Cupboard, circa 1900, painted wood, maker unknown, decorated by Angelica Bell circa 1938, 182.3 cm x 64.5 cm x 42.5 cm. Screen, circa 1913, wooden panel, decorated by Duncan Grant for the Omega Workshop, reverse side repainted by Grant in 1969, 174.5 cm x 202 cm x 2 cm. Secretaire, late 18th century, walnut, maker unknown, fall-front, France, 146.8 cm x 91.5 cm x 36.5 cm. Prov: Purchased in Cassis by Vanessa Bell. Chair, set of six, 18th century, painted gesso on wood, linen upholstery,'Grapes' design by Duncan Grant 1932, reproduced by Laura Ashley 1987, Venice, 102.2 cm x 49 cm x 49 cm. Prov: Purchased by Clive Bell. Table, 18th century, walnut, maker unknown, France, 68.3 cm x 55.5 cm x 39 cm. Cupboard, circa 1890, painted wood, manufactured to contain a folding bed by the Folding Brass Bed Company, Hart Street, London, decorated by Vanessa Bell circa 1917, 219 cm x 91 cm x 32 cm. Prov: D. Grant. Chair, bergere chair, early 19th century, wood, cane and painted gesso, maker unknown, Continental, 89 cm x 58 cm x 64 cm. Commode, mid 18th century, walnut veneer with olive and boxwood inlay, maker unknown, Northern Italy, 80.5 cm x 60 cm x 38 cm. Prov: Purchased in Rome by V. Bell 1920. Chest of drawers, early 19th century, mahogany with inlaid ebony stringing, maker unknown, 105.5 cm x 112 cm x 49.5 cm. Bookcase, one of two, circa 1930, oak, maker unknown, 115 cm x 113 cm x 18 cm. Bookcase, one of two, circa 1930, oak, maker unknown, 113 cm x 108 cm x 18 cm. Table, late 19th century, wood, mahogany, maker unknown, 67 cm x 69 cm x 40 cm. Chair, part upholstered armchair, late 19th century, beech with cotton upholstery, maker unknown, 98 cm x 69 cm x 80 cm. Table, circa 1950, painted wood, decorated by Vanessa Bell, 59 cm x 50 cm x 33 cm. Chair, upholstered armchair, circa 1850, wood with cotton upholstery, maker unknown, 97 cm x 73 cm x 90 cm. Table, two-tier occasional table, circa 1920, painted wood, labelled (underneath) 'Mrs. Bell - Charleston - Firle', maker unknown, 60 cm x 39 cm x 36 cm. Cabinet, mid 19th century, walnut, glass, maker unknown, Holland, 229 cm x 168 cm x 49 cm. Prov: One of a pair owned by William Makepeace Thackeray and, by descent, by Vanessa Bell. Table, side table, circa 1900-50, pine, maker unknown, 74 cm x 120 cm x 60 cm. Easel, late 19th century, oak with iron spanner for adjustment, commercially produced by John B. Smith, 117 Hampstead Road, London, 216 cm x 64.9 cm x 68.5 cm. Model's throne, early 20th century, painted plywood, maker unknown, 37.6 cm x 126 cm x 98.2 cm. Cabinet, music/record cabinet, circa 1920, painted wood, maker unknown, 81 cm x 60.6 cm x 40 cm. Cupboard, 'The Adam and Eve cupboard', made in 18th century from 17th century panelling, oak, decorated by Duncan Grant in 1913, maker unknown, 61.3 cm x 54 cm 28 cm. Cupboard, date unknown, painted pine, decorated by Richard Shone circa 1970, maker unknown, 121.2 cm x 96.6 cm x 50 cm. Radiogram, circa 1930, painted mahogany, decorated by Angelica Bell circa 1936, commercially manufactured by His Master's Voice, 79.2 cm x 69.3 cm x 40.6 cm. Chair, stick back chair, date unknown, painted wood, decorated by Richard Shone circa 1970, maker unknown, 84 cm x 38.5 cm x 52 cm. Cabinet (gramaphone), Music Room cabinet, 1932, painted pine, decorated by Duncan Grant, part of the Ideal Music Room scheme commissioned from Duncan Grant and Vanessa Bell by the Lefevre Gallery in 1932, 98.4 cm x 78.2 cm x 43 cm. Table, date unknown, plywood and linoleum, maker unknown, 88.5 cm x 182.3 cm x 60 cm. Prov: Introduced to Charleston during the 1980s restoration and adjusted to fit over radiator. Cupboard, circa 1810, mahogany, maker unknown, 118 cm x 45.6 cm x 65 cm. Prov. Purchased by D. Grant from (or through) James Rushton, Lewes, circa 1971-72. Commode, mid 18th century, inlaid walnut, maker unknown, Italy, 92 cm x 131.2 cm x 64.6 cm. Prov: Purchased by Duncan Grant in Rome 1920. Chair, "The Famulus Chair", 1937, Bentwood, manufactured by P. E. Game Ltd., College Green, Bristol, 75 cm x 58.5 cm x 74 cm. Prov: Gift from Virginia Woolf to V. Bell. In the latter's London studio by 1938 when it was criticized by Walter Sickert. Table, 20th century, painted wood, maker unknown, decorated by Vanessa Bell circa 1950, 46.5 cm x 30.5 cm x 30.5 cm. Box, date unknown, painted wood, maker unknown, decorated by Richard Shone circa 1971-72, 26.5 cm x 53 cm x 30 cm. Sofa, early 19th century, mahogany frame with horsehair upholstery, maker unknown, 88 cm x 188.5 cm x 74 cm. Prov: Purchased and adapted by The Charleston Trust during 1980s restoration. Chair, set of six, 18th century, painted gesso on wood, linen upholstery, 'Grapes' design by Duncan Grant 1932, reproduced by Laura Ashley 1987, Venice, 102 cm x 49.5 cm x 50 cm. Prov: Purchased by C. Bell. Table, tripod table, circa 1840, mahogany, maker unknown, 69.5 cm x 88.5 cm. Bookcase, circa 1925, painted wood, maker unknown, decorated by Duncan Grant, for Clive Bell's rooms in Gordon Square, London, 240 cm x 385 cm x 39 cm. Prov: C. Bell. Table, Pembroke table, late 18th century, mahogany, maker unknown, England, 70 cm x 98 cm x 71 cm. Chair, late 19th century, stained pine and beech, America, 91.5 cm x 43 cm x 42.5 cm. Bookshelf, circa 1940, painted pine, maker unknown, 199 cm x 120 cm 26.5 cm. Prov: Clive Bell, brought to Charleston from his rooms in Gordon Square, London. Table, side table, 19th century, painted pine, maker unknown, decorated by Duncan Grant in 1930, 74 cm x 75 cm x 44 cm. Chair, 19th century, painted wood, maker unknown, decorated by Duncan Grant, 82 cm x 38.2 cm x 53 cm. Mirror, 20th century, painted wood and mirror glass, maker unknown, 130 cm x 53.9 cm. Table, early 19th century, tripod table, maker unknown, 72 cm x 56 cm. Bookcase, early 20th century, painted softwood, maker unknown, 106.5 cm x 196 cm x 27 cm. Chair, early 19th century, mahogany bergere library chair, maker unknown, fitted with two loose cushions with linen covers in 'White' design by Vanessa Bell, 1913, reproduced by Laura Ashley, 1987, 95 cm x 67 cm x 87 cm. Reading stand, circa 1870, cast iron and mahogany, Cartes Ltd, London, 135 cm x 45 cm x 45 cm. Prov: C. Bell. Chair, bergere armchair, early 19th century, painted wood, cane, cotton upholstery, maker unknown, France, 89 cm x 57 cm x 59.5 cm. Cupboard, 1901-1910, wood, maker unknown, decorated by Duncan Grant circa 1930, for Clive Bell's rooms in Gordon Square, London, 205 cm x 133 cm x 96 cm. Prov: Clive Bell, brought to Charleston 1939. Table, 19th century, mahogany tripod table, maker unknown, 71 cm x 80 cm. Bed, late 18th century, painted wood, decorated by Vanessa Bell for Clive Bell circa 1950, maker unknown, France, 127 cm x 115 cm x 186 cm. Prov: Clive Bell, bequeathed Barbara Bagenal 1964; by whom bequeathed Charleston Trust 1984. Table, gypsy table, 19th century, painted wood, decorated by Vanessa Bell circa 1920, maker unknown, 61 cm x 57 cm x 57 cm. Chair, one of two, late 18th century, oak, canvas work designed by Vanessa Bell circa 1924, worked by Ethel Grant, maker unknown, Holland, 93 cm x 51 cm x 53 cm. Cupboard, circa 1910, wood, maker unknown, 205 cm x 133.7 cm x 80 cm. Bookcase, circa 1890, walnut, maker unknown, 89 cm x 135 cm x 38 cm. Prov: Introduced to Charleston by A. O. Bell during 1980s restoration. Bookcase, circa 1890, walnut, maker unknown, 89 cm x 127 cm x 34.5 cm. Table, gate leg, 19th century, oak, maker unknown, 70.5 cm x 69.5 cm x 83 cm. Bed, 'The Morpheus Bed', date unknown, wire spring base and mattress, painted wood, decorated by Duncan Grant for Vanessa Bell circa 1917, maker unknown, 124 cm x 90.6 cm x 198 cm. Settle, four chair back seated settle, circa 1800, wood with rush seating, maker unknown, England, 80 cm x 183 cm x 59 cm. Prov: Given to Clive Bell by Mary Hutchinson in 1950s. Chest, linen chest, date unknown, painted wood and upholstery, decorated by Duncan Grant in 1917, maker unknown, Charleston, England, 49 cm x 93.5 cm x 42.5 cm. Chimney board, one of a pair, decorated by Duncan Grant circa 1930, maker unknown, 97 cm x 91 cm. Chest of drawers, specimen chest, circa 1850, wood, maker unknown, 42 cm x 38 cm x 22.5 cm. Prov: Possibly from the Stephen family lepidoptera collection. Bookcase, mid 19th century, mahogany, decorated by Quentin Bell circa 1970, maker unknown, 101 cm x 182 cm x 31.5 cm. Table, 'The Lilypond Table', base early 19th century, painted wood, designed by Duncan Grant for the Omega Workshop circa 1913 - 1914, maker unknown, 73 cm x 126 cm x 79 cm. Prov: d'offay, from whom purchased by Charleston Trust, 1980s. Table, side table, date unknown, painted wood, decorated by Duncan Grant, maker unknown, 72.5 cm x 82.5 cm x 49.5 cm. Cupboard, circa 1900, painted wood, maker unknown, 213 cm x 85 cm x 33.5 cm. Cupboard, late 19th century, walnut, maker unknown, 61.5 cm x 59 cm x 15 cm. Chair, Prie-Dieu, one of a pair, mid 19th century, gilded wood and upholstery, Robert Strahan and co, Dublin, 104.8 cm x 53 cm x 55 cm. Prov. Purchased by D. Grant in Brighton circa 1917-18. Chair, Prie-Dieu, one of a pair, mid 19th century, gilded wood and upholstery, Walter Fleming, Dublin, 104.8 cm x 53 cm x 55 cm. Prov: Purchased by D. Grant in Brighton circa 1917-18. Commode, appears in the portrait of Julian Bell in Vanessa Bell's bedroom, circa 1760, walnut, maker unknown, France, 100.5 cm x 108.5 cm x 54 cm. Prov: Purchased by V. Bell/D. Grant. Chair, early 18th century, walnut with upholstered seat, canvas-work possibly designed by Roger Fry, worked by Ethel Grant, maker unknown, 106 cm x 52 cm x 52 cm. Desk, mid 18th century, walnut, satinwood veneer with brass handles, maker unknown, Northern Italy, 89 cm x 125 cm x 62 cm. Cabinet, circa 1870, gold lacquer, maker unknown, Japan, 35.5 cm x 38.2 cm x 17.9 cm. Prov: Grant family. Seat, window seat, circa 1800, wood, canvas-work designed by Vanessa Bell in 1943 and worked by Ethel Grant (see separate accession number T/171), maker unknown, France, 80.5 cm x 187 cm x 68 cm. Table, circa 1930-35, painted wood, decorated by Duncan Grant, maker unknown, 44.5 cm x 50.5 cm x 56 cm. Lamp base, circa 1930-35, painted wood, light fitting (see lampshade T/172), decorated by Duncan Grant, 51 cm x 20 cm. Bed, 20th century, wood with sprung base and mattress, maker unknown, 53 cm x 123 cm x 196 cm. Chair, circa 1790, walnut, canvas-work designed by Vanessa Bell circa 1924 and worked by Ethel Grant, maker unknown, 95.5 cm x 51 cm x 51 cm. Stool, circa 1924-25, walnut, upholstered, canvas-work designed by Duncan Grant and worked by Ethel Grant, exhibited at the Independent Gallery, London, in 1925, maker unknown, 40.5 cm x 92.5 cm x 76 cm. Chair, spoon back chair, circa 1860, walnut and iron, upholstered, maker unknown, 76 cm x 66 cm x 66 cm. Table, three tier table, circa 1950, painted wood, decorated by Vanessa Bell, maker unknown, 63.6 cm x 33.3 cm x 25.4 cm. Chair, ladder back, 18th century, painted oak, rush seat, maker unknown, Holland, 92.2 cm x 48 cm x 41 cm. Chimney board, circa 1925-30, decorated by Vanessa Bell, maker unknown, 92 cm x 89 cm. Towel rail, early 19th century, mahogany, maker unknown, 80 cm x 47 cm x 41 cm. 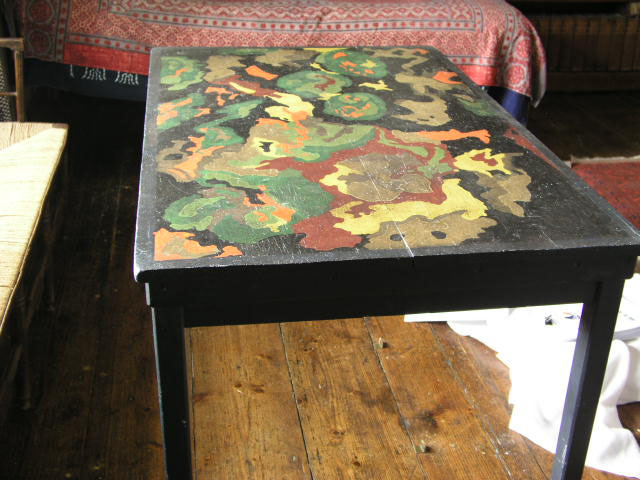 Table, circa 1945, painted wood, decorated by Duncan Grant, maker unknown, 73 cm x 91 cm x 44 cm. Chair, circa 1910, wood, rush seat, maker unknown, 83 cm x 40 cm x 42 cm. Bookcase, 19th century, painted wood, maker unknown, 122.5 cm x 126.5 cm x 22 cm. Chair, circa 1810, wood, rush seat, maker unknown, 84 cm x 44 cm x 40 cm. Chair, child's chair, circa 1800, oak, maker unknown, England, 59 cm x 36 cm x 31 cm. Table, tripod table, circa 1810, elm, maker unknown, England, 69.6 cm x 49.5 cm. Washstand, circa 1946, painted wood, decorated by Duncan Grant, maker unknown, 89.3 cm x 75 cm x 40 cm. Chair, drawing room occasional chair, circa 1860, painted beech and upholstery, reupholstered by Goacher of Lewes in 1985, maker unknown, England, 72 cm x 46 cm x 52 cm. Chair, William IV library chair, circa 1828, wood, linen upholstery 'Grapes' design by Duncan Grant 1932, reproduced by Laura Ashley 1987, maker unknown, 96 cm x 73 cm x 86 cm. Bookcase, early 19th century, painted wood, decorated by Duncan Grant, circa 1925, maker unknown, 106 cm x 157 cm x 36 cm. Chimney board, decorated by Vanessa Bell, circa 1935, oil on wood, 108 cm x 109 cm. Box, circa 1920, painted pine, maker unknown, 19 cm x 37.5 cm x 40.5 cm. Box, circa 1918-1960, painted wood, decorated by Vanessa Bell for Angelica Bell, maker unknown, 9 cm x 25 cm x 16.2 cm. Writing slope, formerly used as a palette by W.R. Sickert, 19th century, mahogany, maker unknown, 10.2 cm x 55.7 cm x 41.2 cm. Screen, undated, material unknown, maker unknown, decorated by Duncan Grant, 132 cm x 180.6 cm. Easel, 20th century, wood, maker unknown, 103 cm x 64 cm x 17 cm. Easel, circa 1940, beech, iron fittings, Winsor and Newton, London, 160 cm x 13 cm x 18 cm. Table, circa 1840, mahogany, maker unknown, 72 cm x 121 cm. Prov: Dr George Rylands; this table was used for the lunch party in Cambridge that inspired Virginia Woolf's essay, 'A Room of One's Own'; bequeathed The Charleston Trust 1999. Box, dressing case box, 19th century, wood, maker unknown, 20 cm x 32 cm x 25 cm. Seat, garden bench, facsimile, 20th century, painted wood, maker unknown, 96 cm x 83 cm x 53 cm. Cupboard, 20th century, painted wood, decorated by Vanessa Bell, maker unknown, 216 cm x 168.5 cm x 56 cm. Table, 19th century, oak and pine with brass fittings, maker unknown, 73 cm x 152 cm x 127 cm. Table, side table, painted wood, maker unknown, 73 cm x 91.5 cm x 51 cm. Bookcase, circa 1925, painted wood, maker unknown, 240 cm x 174 cm x 18 cm. Bookcase, circa 1925, painted wood, maker unknown, 241 cm x 176 cm x 30 cm. Shelf, circa 1925, painted wood, maker unknown, 3.5 cm x 138 cm x 18 cm. Mirror, date unknown, wood, mirror glass, maker unknown, 212 cm x 91 cm. Mirror, date unknown, gilded wood, gesso, maker unknown, 134 cm x 84 cm. Mirror, date unknown, mirror glass, unframed, maker unknown, 68 cm x 88 cm. Mirror, date unknown, wood, mirror glass, maker unknown, 69 cm x 45 cm. Garden seat, deckchair, early 20th century, wood, canvas, maker unknown, 97 cm x 74 cm x 96 cm. Mirror, date unknown, wood, mirror glass, maker unknown, 152 cm x 126 cm. Chair, armchair, circa 1870, wood, leather upholstery, maker unknown, 98 cm x 55 cm x 63 cm. Box, date unknown, wood, ivory, mother of pearl, maker unknown, 5 cm x 6 cm x 4 cm. Chaise longue, formerly in collection of Walter Sickert, early 19th century, ebonised and gilded wood, original upholstery, 92 cm x 199 cm x 69 cm.